Recently it was my friend’s birthday. I have this thing about baking birthday cakes for friends. I think it’s actually programmed into my DNA somewhere. I am not the best cake decorator (even good – not so much), but I believe that it’s more important that the cake taste amazing. Because that’s the point really – you’re going to eat it, so it should taste good (especially on you birthday!). 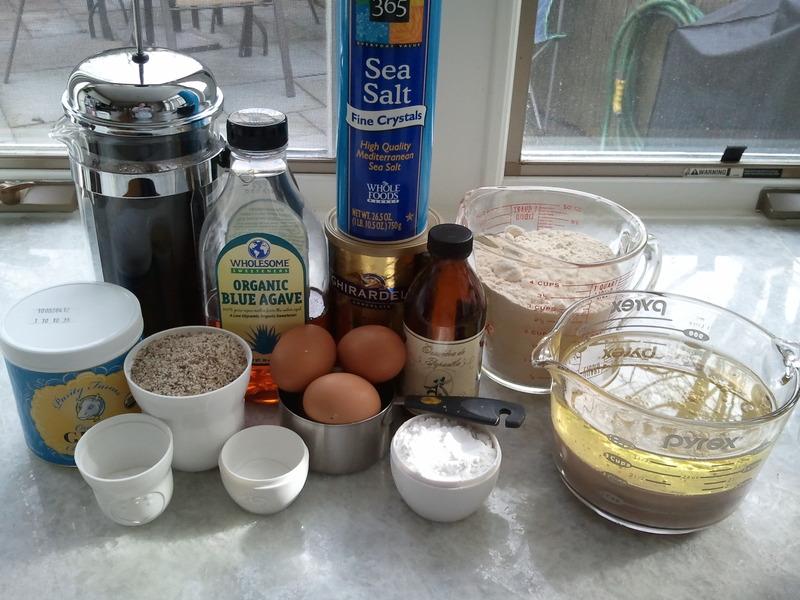 Anyhow, this recipe had a first for me (I love those in baking and cooking) – coffee icing. It turns out that it is delicious, particularly on a chocolate cake. So thank you Jillian for requesting this cake for your birthday. I really enjoyed making it and hope that you do too. Preheat the oven to 350F. 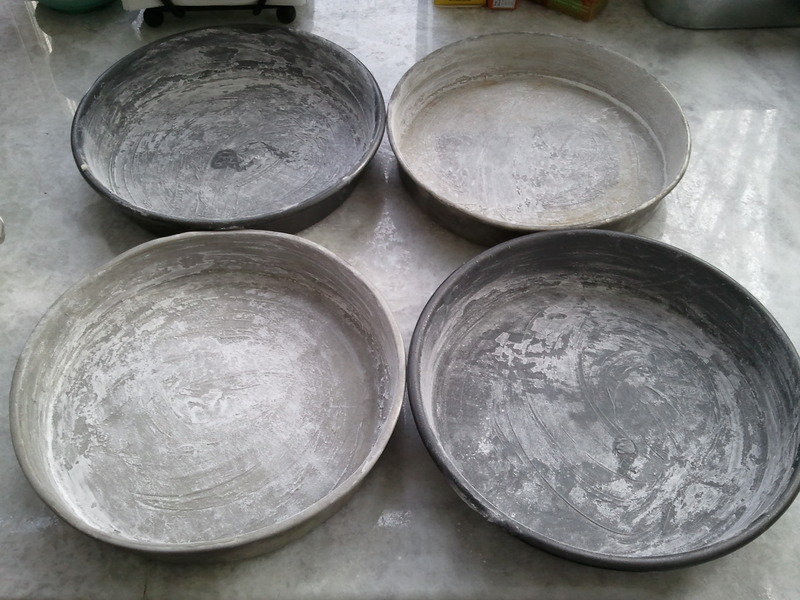 Grease and flour four nine inch cake pans (the point is to lightly coat the pans with a fat and flour so that the cakes will not stick to the pans – so don’t go crazy, but do make sure you get the ghee into the crease of the pans). Make two cups of hot coffee – I used a french press but you can use drip coffee, espresso (intense flavor), or even instant coffee (that’s right, instant coffee). 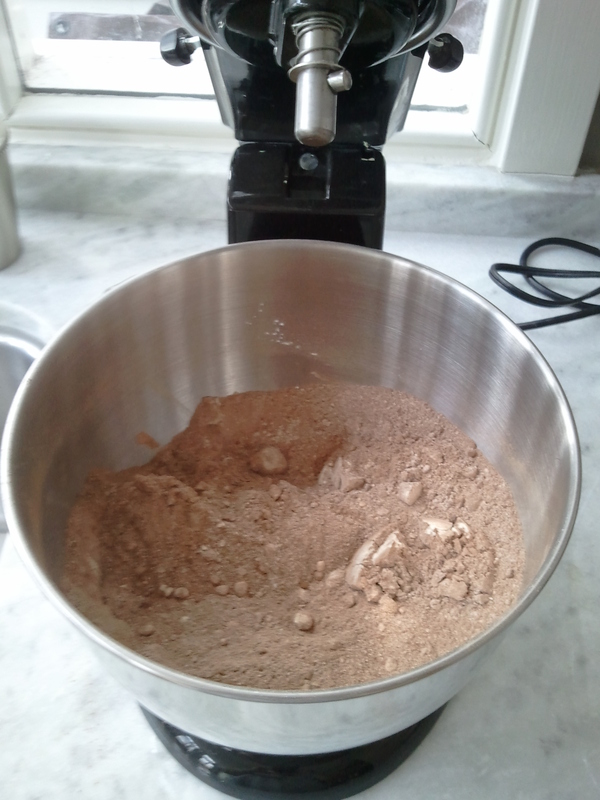 Add the dry ingredients to a large mixing bowl and briefly mix with a spoon. Add the wet ingredients to the bowl and mix on low speed until all ingredients are just mixed. 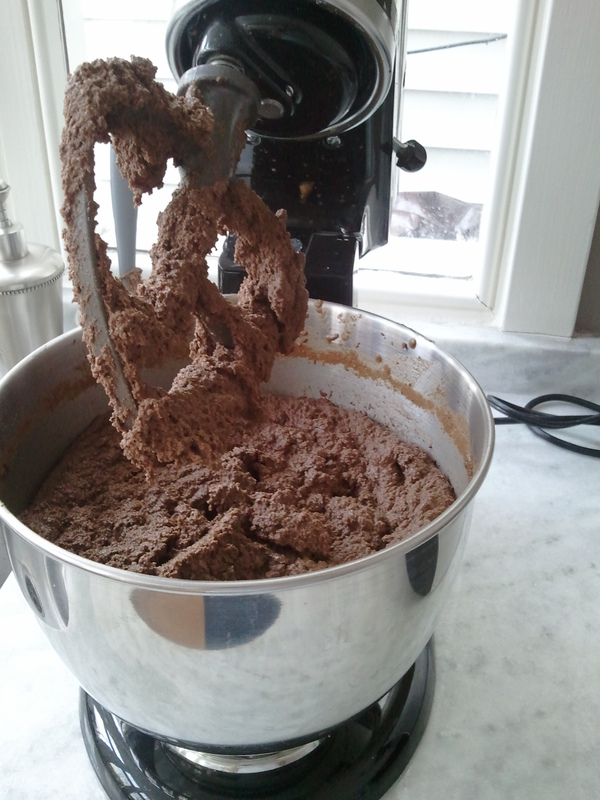 Then increase mixing speed to medium and mix for at least two minutes. Be sure to scrape the sides a few times and mix again for another two minutes. 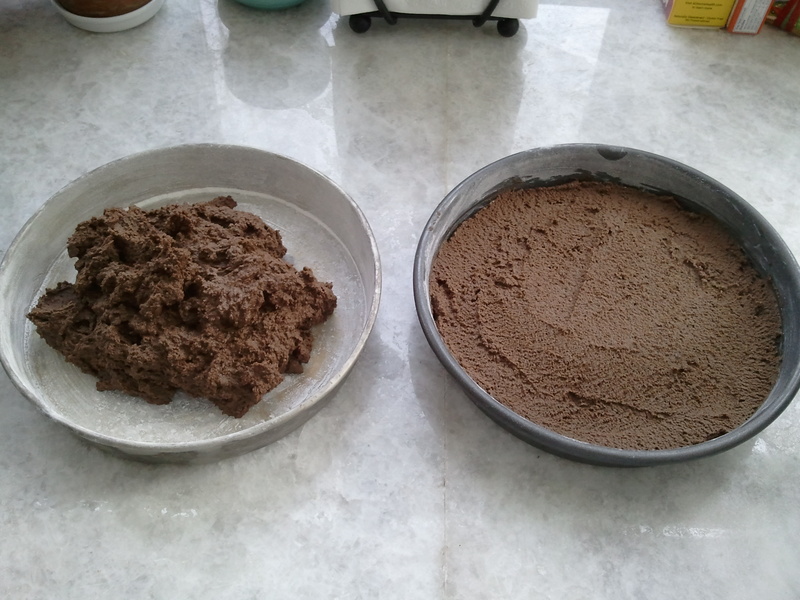 Add the batter to four cake pans, evenly distributing the batter. 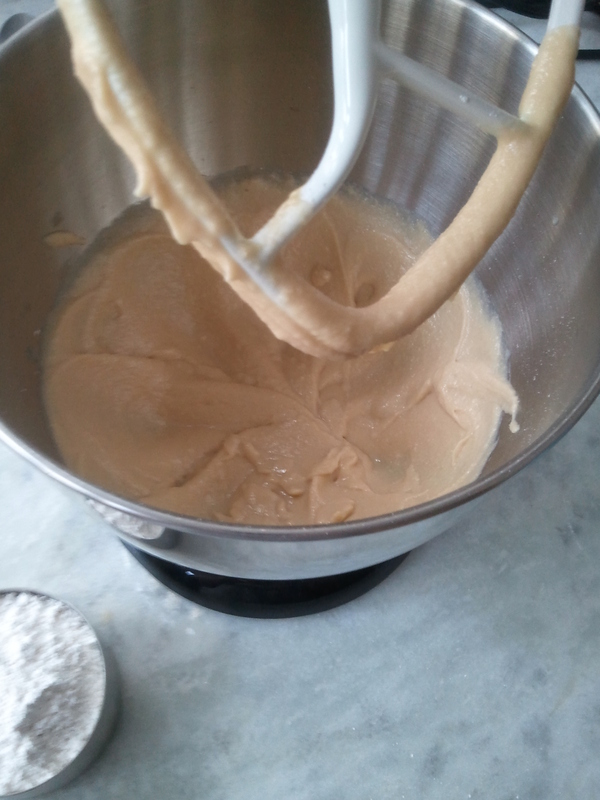 The batter is not as fluid as a typical cake batter so you’ll probably have to actually spread the batter out using a spatula. Try to make it pretty because the surface won’t necessarily even out on it’s own. Place the pans in the center of the oven – I put two on the top rack and two on the bottom rack directly in the center of the oven, directly adjacent to one another. Bake for 20-25 minutes, or until a toothpick inserted into the center of the cake comes out clean. The right toothpick came out with a little batter on it so I knew it needed about another 2 minutes. 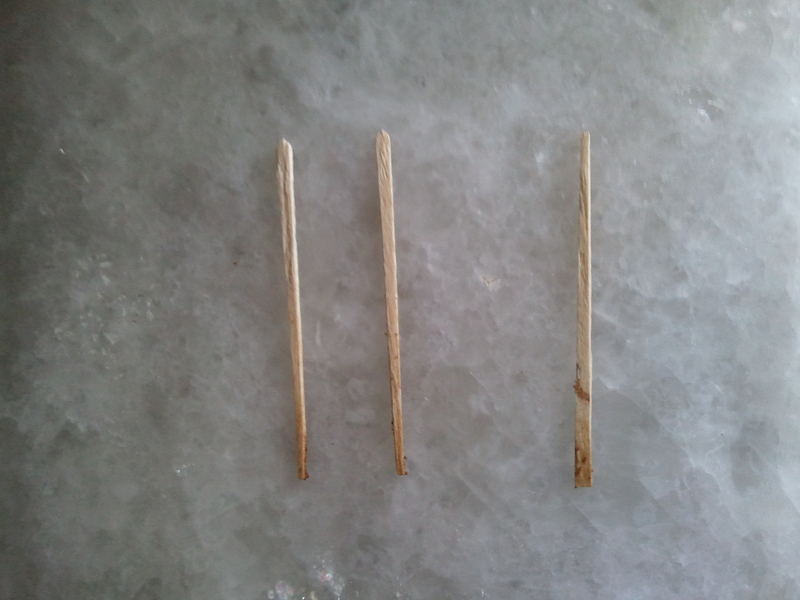 The two left toothpicks were clean, so those cakes were done baking. Now, you need to let the cakes cool completely before icing them or the icing will melt and become a sticky mess. If you’re in a rush, place the cakes in the fridge or freezer even. As long as the center is cool to the touch, you’re good to go. Heat the coconut milk and add 5 T. instant coffee to the milk – stir until dissolved. Cream the coconut oil, ghee and vanilla in a large bowl. Add the salt. Add 1/4 c. of the coffee coconut milk and mix well. Add 1 c. of the sugar at a time and beat until fluffy (for a total of 4 cups). 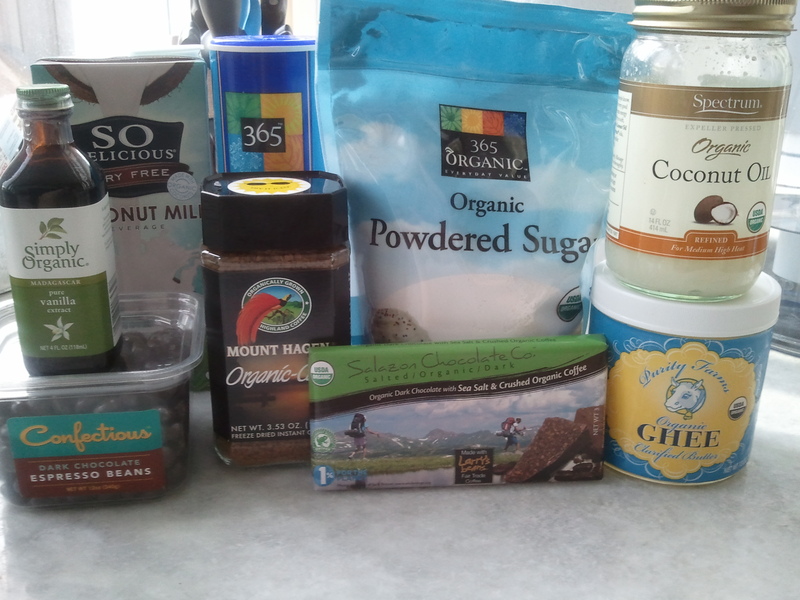 Add the remaining 1/4 c. of the coffee coconut milk and repeat 1 c. additions with the remaining sugar. How will you know it’s the right consistency? 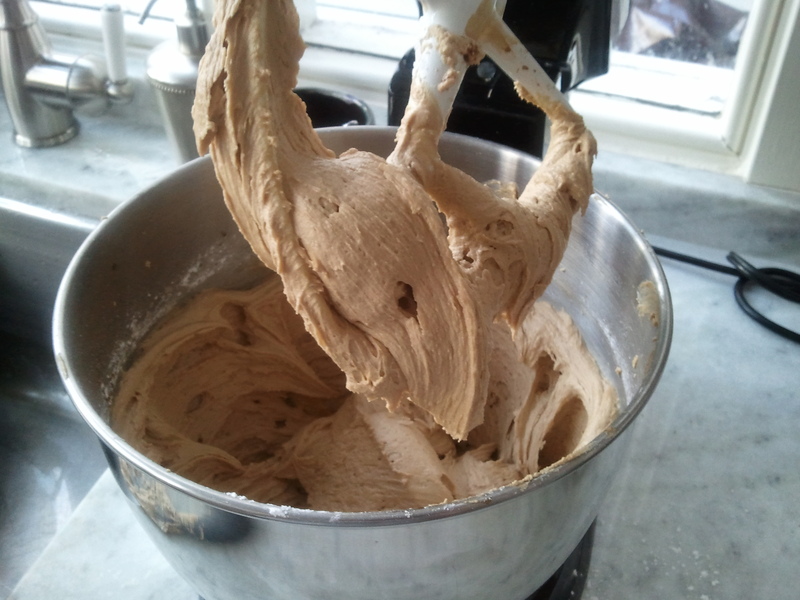 It will not have lumps of sugar and it will stick to the beater. 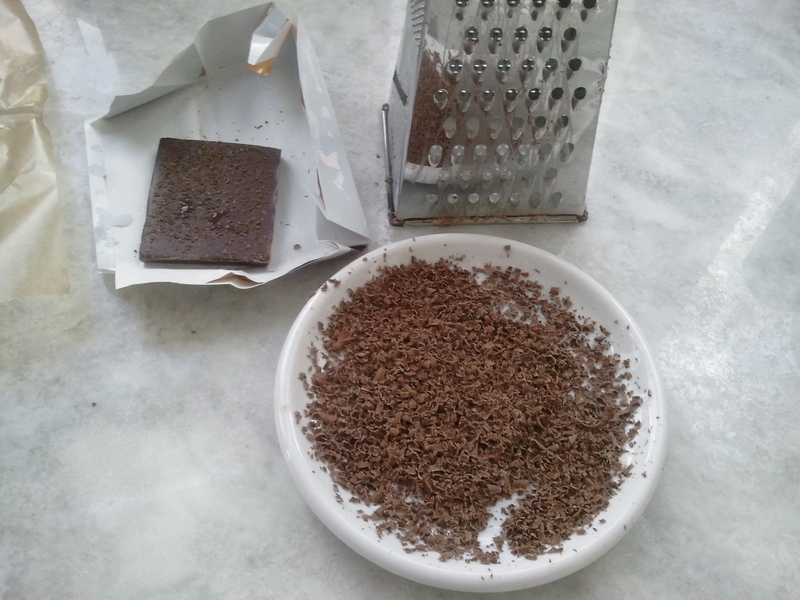 Now, grate 1/2 the chocolate bar and set aside. I used a standard grater – nothing fancy. You’ll dust the iced cake with this. 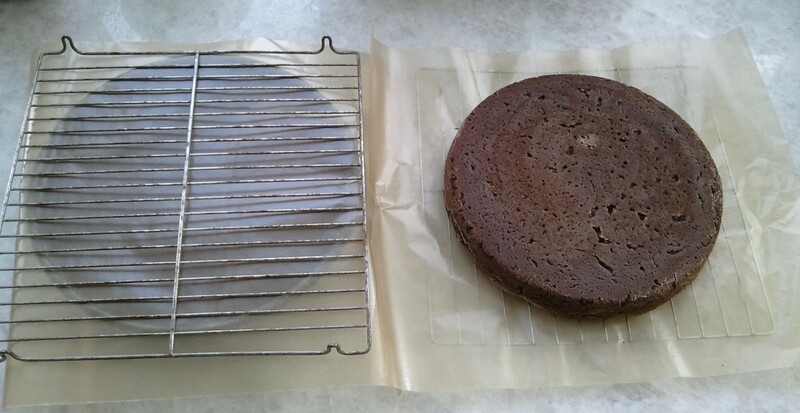 Place the bottom layer of your cake on a plate, centered. Use a spatula and spread 1/5 of the icing evenly over the top of the layer. Sprinkle the iced layer lightly with instant coffee. Now, with your remaining icing, coat the sides of the cake. 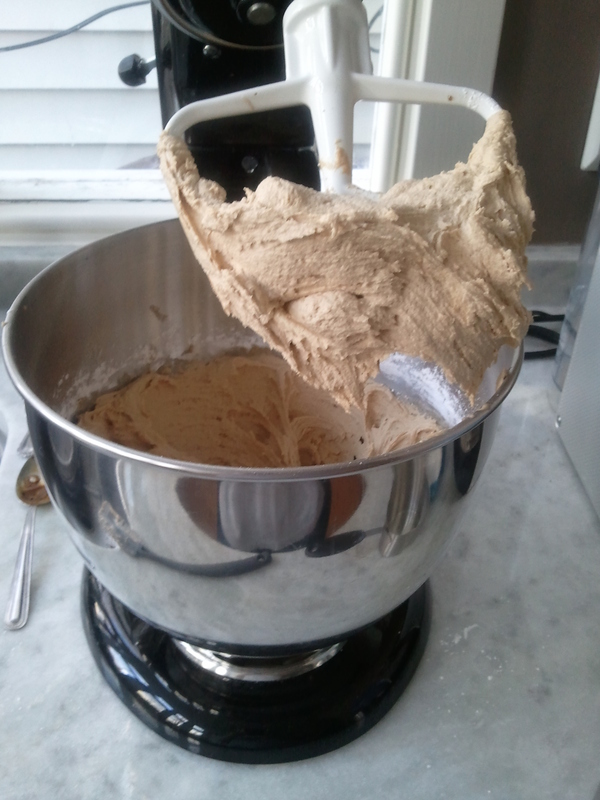 You can smooth the icing by running the spatula under hot water or by dipping it into a cup of hot water. 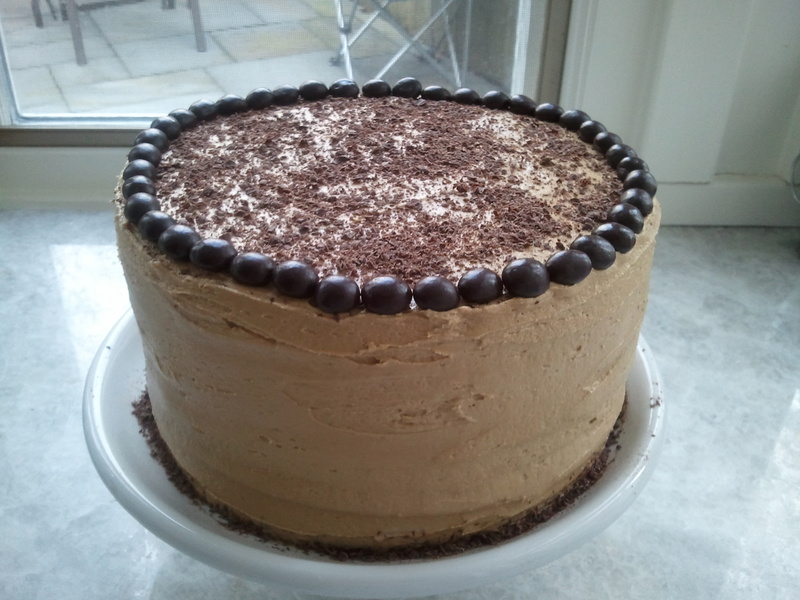 Finally, I garnished the top layer of the cake with the chocolate “dust” and chocolate covered espresso beans. I also dusted the bottom of the plate with the chocolate “dust” – it’s great for covering up imperfect spots on the cake. 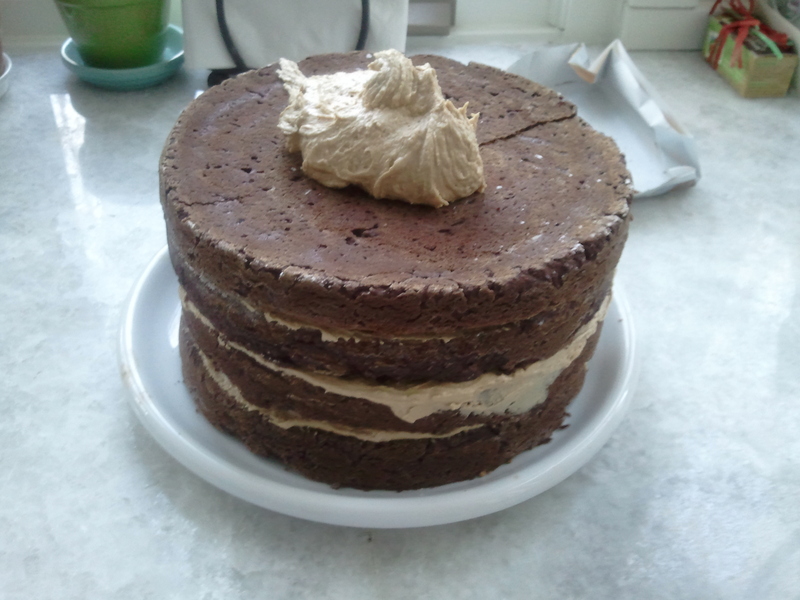 This entry was posted in baked good, chocolate, dessert and tagged cake, chocolate, coffee, espresso beans, icing. Bookmark the permalink. Seriously, it was the most delicious thing ever. It was 4 layers of heaven wrapped in awesome.